Those of you who have travelled to Greece or eaten at a Greek taverna will undoubtedly be familiar with this squid (kalamari) dish. Without question, this is one of the most recognizable Greek seafood dishes, and it is easily the simplest to prepare. Among ancient Greek foodies, squid was classified as “fish for the frying pan” and it was usually served up as a “forerunner” or appetizer to a meal. Over two thousand years later and not much has changed. Today, there is hardly a Greek food restaurant anywhere which does not include this dish on its menu. Usually, pan-fried kalamari is served with an accompanying dollop of tzatziki (garlic yogurt) sauce and a wedge of lemon. Instead of tzatziki, I often serve scorthalia (a garlic potato purée) along with these fried squid segments. This substitution is really quite a successful one and I highly recommend it. For anyone observing the Lenten fast prior to Easter, scorthalia makes an excellent alternative to the dairy based tzatziki. Now, the most common complaint I hear about squid cooked in this fashion is that it often ends up being rather rubbery and chewy. This happens when it is overcooked. My rule of thumb is two and a half minutes cooking time in the pan, and thirty seconds to drain on a dish lined with some paper towel before serving - three minutes all told from start to finish. Follow this rule and your kalamari will end up consistently tender. One caveat: the tentacles require a little less time to cook than the ring segments cut from the tubular body of the mollusk. For this recipe, I used large frozen squid tubes without the tentacles which can usually be found in the frozen seafood section of most decent sized supermarkets. The advantage of using the large squid tubes is that they are usually already cleaned and all you need to do is defrost them before using. For a scorthalia recipe, see this posting. If you wish to serve this dish with tzatziki, you can find a video recipe for it here. Defrost and wash the squid tubes. Slice the squid into ring segments, approximately ¼ inch in width. Put the flour and corn flour in a clear plastic bag and shake to mix thoroughly, then add the squid segments and shake them around in the flour to ensure a complete coating. Note: as the squid rings are already moist, no extra liquid will be required to ensure the flour coating adheres to the rings. The pointed end of the squid tubes can simply be split in half to ensure they are completely covered in the flour mixture. Heat the oil in a frying pan over a medium heat. Make sure to use enough oil to completely immerse the squid rings for frying. Using a wooden spoon, loop some of the floured ring segments over the handle until you have a good batch for frying then proceed to add the squid rings to the oil, one by one in a clockwise fashion until the pan is full. Do keep an eye on the time and at the 2 ½ minute mark start removing the rings again in a clockwise order from your starting point in the pan. Place the cooked squid rings in a plate lined with paper towel to drain until all the squid has been cooked and serve immediately. 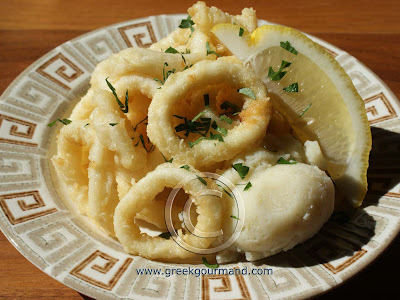 Be sure to sprinkle the fried kalamari liberally with fresh-squeezed lemon juice and serve it with either scorthalia or tzatziki (as already mentioned and pictured in the photo above). There you have it, some pan-fried kalamari to serve as an appetizer or even as part of a main course if you should be so inclined. Easy peasy lemon squeezy Greek food! Finally, today, March 25th is Greek Independence Day and a national holiday in Greece. This date commemorates the start of the War for Greek Independence from the Ottoman Empire after nearly 400 years of occupation. The celebrations for this day consist of parades throughout Greece and the Greek Diaspora. Here in Toronto, our Independence Day parade will take place this coming Sunday along Danforth Avenue which comprises the heart of Toronto’s Greektown. 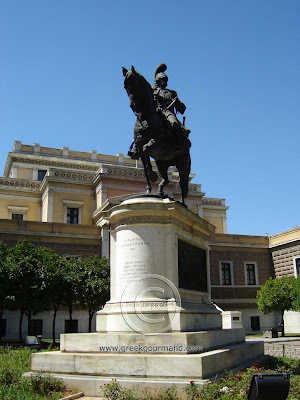 Statue of Theodoros Kolokotronis (Θεόδωρος Κολοκοτρώνης) in Athens, front of old parliament. Click to Enlarge Image. According to the Greek Orthodox calendar this day also marks the Annunciation of the Virgin Mary and the traditional dish that is served is fried bakaliaros (cod) accompanied by a generous helping of scorthalia. Greeks who are observing the Lenten fast are allowed this exception and they customarily consume the fried bakaliaros dish on this day. In point of fact, my wife and I, along with our son, are getting ready to go to my parents’ home to enjoy the fried bakaliaros with scorthalia even as I am finishing up this post. The customary greeting for this day is “Zito e Ellada” (Ζήτω η Ελλάδα!) which translates as “Long Live Hellas (i.e. Greece)”. So, to all my Greek friends, Happy Independence Day!